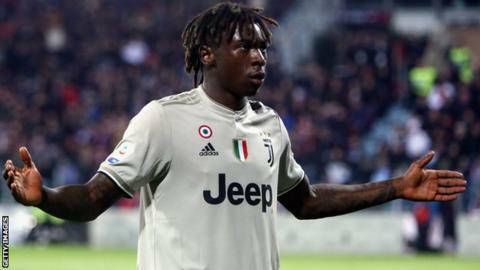 Juventus' teenage forward Moise Kean was the target of racist abuse in a Serie A match on Tuesday and the response in the Italian media has been mixed. Kean, 19, scored his side's second goal in the 2-0 win at Cagliari and celebrated by holding his arms outstretched, seemingly in response to racist chants. The Italian's team-mate Leonardo Bonucci said "the blame is 50-50" between Kean and Cagliari fans. Bonucci has since said "abuses are not acceptable at all and this must not be misunderstood", after receiving criticism from England and Manchester City midfielder Raheem Sterling. Cagliari president Tommaso Giulini claimed Kean's reaction incited fans, saying: "What happened at the end was because of a celebration which was wrong and it would have happened with any other player." Juventus boss Massimiliano Allegri said Kean "shouldn't have celebrated in that manner" but called on the authorities to act. Kean has received support, notably from Sterling, team-mates Blaise Matuidi and Giorgio Chiellini, as well former Manchester City midfielder Yaya Toure. But how has the incident been perceived across Italian media? Sky Sport Italy is being criticised for its post-match coverage, which saw presenter Marco Cattaneo blame the incidents on "a few idiots" and comment that "Kean went a bit too far with Cagliari fans". Juve coach Allegri was then asked whether Kean's gesture is a giveaway that "he is not yet mature", to which Allegri replied: "Moise should avoid certain celebrations and certain behaviours" as "it's important to respect the adversary". The backlash that has followed the controversial coverage has led the director of Sky Sport Italy, Federico Ferri, to pen a rare reply to the critics. In a blog post published on Thursday, Ferri said that presenters in the studio "could not hear" the racist chants that might have seemed loud from the pitch, and as such dismissed Kean's gesture as an overreaction. Ferri also commented that although "racist abuse must be condemned whether it comes from one person or 1,000 people", Kean's celebration "just isn't the best way of celebrating a goal, and it'd be best to… go back to sharing the joy with the rest of the team". Sardinia's most popular newspaper, L'Unione Sarda, called Kean's gesture an "incendiary celebration", and noted that "there are at least two aspects we need to clarify: did Cagliari fans only use insults and whistling, or also racist abuse? And did they target Kean after his provocation, or before, because of the colour of his skin? […] Either way, racist abuse came from a handful of people at most." Juventus outlets are unanimous in condemning the chants, but slightly more reluctant to criticise defender Bonucci's comments that "the blame is 50-50". Il Bianconero ("The Black-and-White"), a Juve-focused platform, called Bonucci "a leader on and off the pitch", lauding him for his strong words on Kean, which show "a true captain's attitude". A separate piece harshly condemned racism in stadiums ("the vulgar routine and plague of every Sunday") but stops short of condoning Kean's "angry, sometimes aggressive" instincts. Juve fan website Juventibus condemned Bonucci, although it pointed out his comments were undoubtedly motivated by his "paternalistic instincts" towards Kean. "[Kean is] a symbol of strength and beauty, everything that makes our football and our country wonderful, against everything that is hateful and unacceptable. He is like the Christ, serenely turning the other cheek," gushed the columnist, who argued that Bonucci sees Kean as his younger brother who needs to be protected "from the media circus that only peddles dumb, simplistic narratives". In this view, the columnist says Bonucci should be condemned, sure, but also understood: "He made the mistake of publicly expressing his paternalistic instinct by using language that was over the top, which has been reported by European media as a partial apology of racism." The coverage of the incident by major outlets unaffiliated with any of the two teams has been relatively sparse and neutral. La Gazzetta dello Sport's post-match analysis read: "The good news (for Juve supporters) is that the team returns from Cagliari having come a bit closer to the Scudetto… The bad news (for Italy as a whole) concerns the whistling and racist abuse directed at Kean." In most papers, the story only got a second wind once prominent football figures began showing their support for Kean and criticised Bonucci's comments. News agency Ansa quotes Mario Balotelli, who used Instagram to tell Kean: "Bonucci is lucky that I wasn't there. Instead of defending you, he does this? ", and Raheem Sterling's comments have circulated similarly widely. A round-up of reaction on Eurosport Italy says "the whole of Europe lambasts Bonucci"; whether Italy will unanimously do the same remains to be seen.